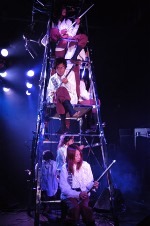 Tower of One-String Guitars: Now That’s Reinvention! I’ve been confused by a feature Gibson is touting on its new Digital Guitar: the ability to route each individual string to a separate surround speaker. Sounds a little like a nightmare surround mix to me. Leave it to the work of an interactive artist to “reinvent the guitar” in the reverse direction: who needs individual string pickups, when you can get six guitarists and give each one a one-string guitar. Then, have them climb atop a giant tower, get a percussionist to trigger drum samples at its base, and load the whole thing into a complex Max/MSP/Jitter and Ableton Live setup with donated hardware and software from M-Audio, Steinberg, Mackie, Canon, and others. Brilliant fundraising, bizarre thinking — I’m sold. IK Multimedia, can you get these crazy kids some Stealth Plug digital guitar cables in time for the performance? What is the sound of one one-string guitarist clapping? Now, to work on finding 88 pianists to play 1-note keyboards . . . one note jamming will never be the same.